Our people are what make us special, and we’d like you to meet them! Tyler was born in Elkhart, IN, but was raised in Venice, Florida. He returned to Elkhart when he was 16 and joined the U.S. Coast Guard at the age of 19. He was in the U.S. Coast Guard for 7 years and spent most of the time in St. Ignace, MI, guarding the straits. Tyler's job during that time was Search and Rescue, Law Enforcement, and lighthouse technician. Tyler graduated from Lake Michigan College with a degree in Viticulture and Enology. Tyler enjoys spending time with his daughter, Madison, and their 4 hens. In his spare time, he enjoys camping, boating, and exploring any Michigan west coast town. 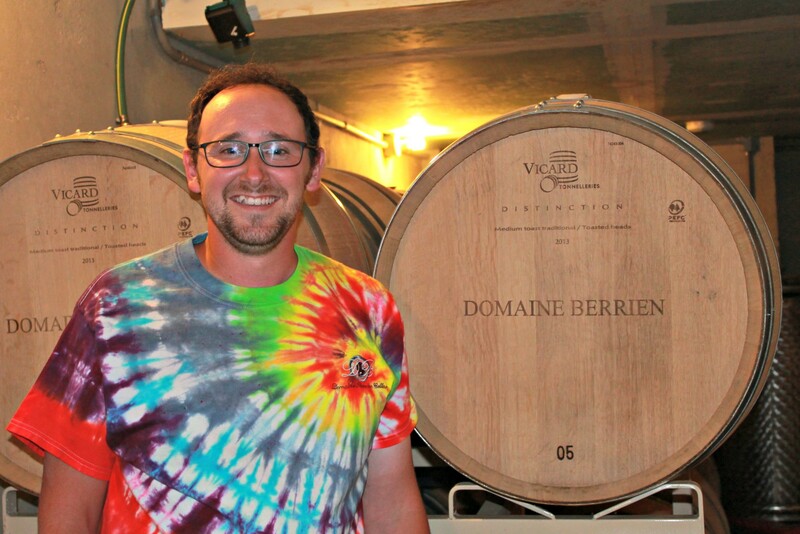 Tyler's favorite Domaine Berrien wines are the Syrah and Dry Traminette. Jennifer is originally from SE Michigan, but has lived in New Hampshire, Massachusetts, Virginia, & Washington DC. Her background is in museums and food, including stints in professional kitchens and historic demonstrations. She is also a published author of mysteries, fantasy, and horror. Her hobbies include traveling, Scandinavian crime dramas, and playing with her Corgi. Jennifer's favorite DBC wines are the Sauvignon Blanc, Wolf's Prairie Red, and whatever goes with what she's cooking! Breena is originally from California, where she met her husband Jake. After moving many times, they settled in Berrien Springs with their 2 children. They enjoy boating on Lake Michigan, hiking, kayaking, and playing with their 2 dogs. Breena also enjoys painting and hosting paint parties. 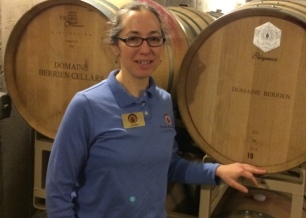 Though she enjoys many Domaine Berrien wines, her favorites are the Riesling, Lemberger and Dry Traminette. Anna, who is a southwest Michigan native, is pursuing her Masters in Philosophy at Western Michigan University. She is a recent graduate with degrees in English, Global and International Studies, and German. In her spare time, Anna enjoys reading and writing, running, and spending time with her horse. Her favorite Domaine Berrien wines are Cabernet Franc, Sauvignon Blanc, and Riesling. 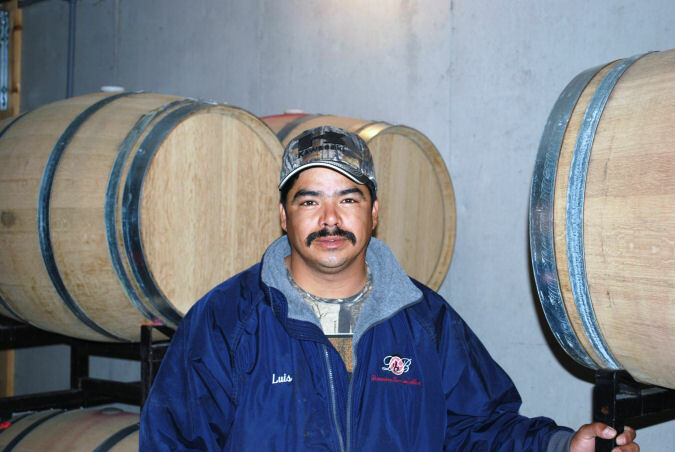 Luis immigrated to the U.S. from Mexico, and is our vineyard foreman. Luis and his wife Tammy live here in Berrien Springs with their three children, Brianna, Caitlyn, and Luis, Jr. When Luis is not working, he enjoys fishing, hunting, and attending his children’s school events. Luis' favorite Domaine Berrien wine is Pinot Noir. 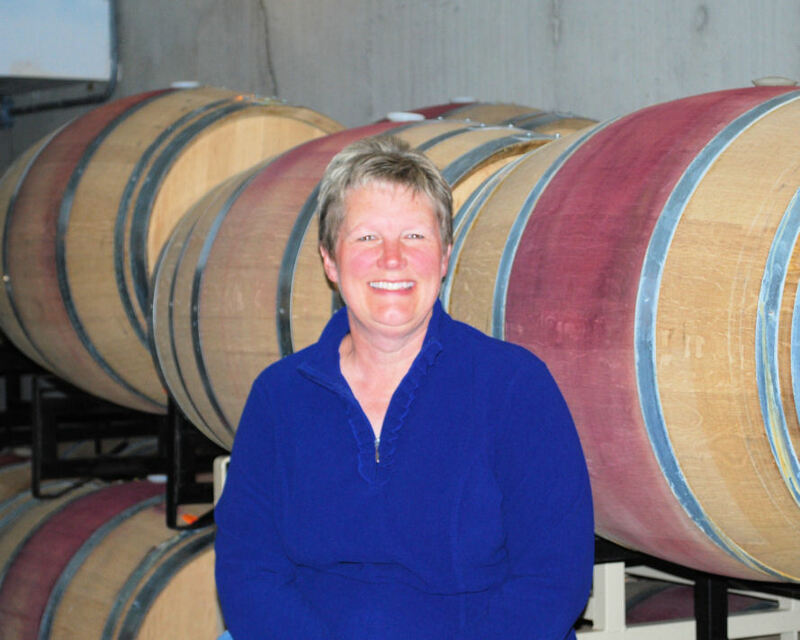 Katie grew up in Kalamazoo, finally settling in the Berrien Springs area after retiring from her construction scheduling job to start her second career – running the winery! Katie is a University of Michigan graduate and is proud to cheer for the Wolverines! Go Blue! When not at the winery, Katie loves walking with her dogs thru the vineyards or sitting on the deck with a glass of wine, bird watching. 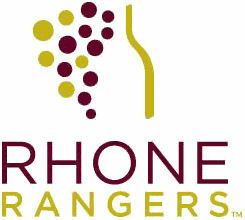 Katie’s favorite Domaine Berrien wines are the Sauvignon Blanc, Viognier and Marsanne. Drink White! Wally is originally from Shaker Heights, OH. 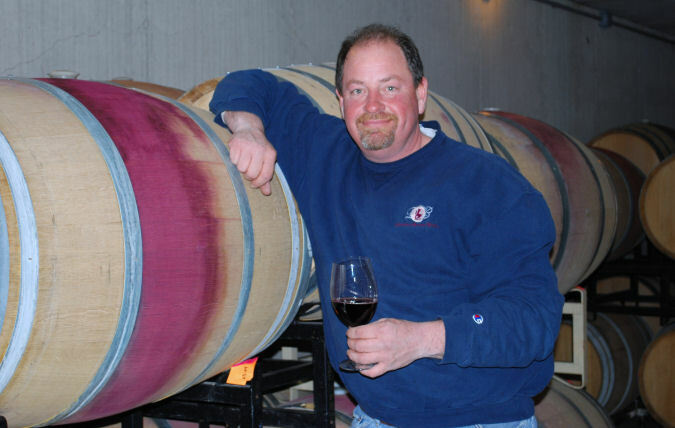 After giving up his corporate career as a purchasing manager, he settled in Berrien Springs to pursue his true passion – growing grapes and making great wine! He loves being outdoors working in the vineyards, or talking to guests about what we do and how we make such excellent wine. When not at the winery, Wally can be found fishing or hunting. His favorite Domaine Berrien wines are the Cabernet Franc, Pinot Noir, and Crown of Cab. Drink Red! Sweet Baco, our first winery dog! Anyone who is a regular at the winery knew and loved Baco. Baco was our larger than life Black Lab. He had three main passions in life: playing ball, eating anything anyone dropped, and sleeping in the back room. 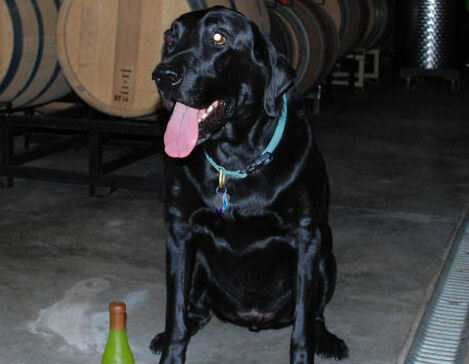 Baco was a celebrity, having been featured in the “Wine Dogs of America” book on page 306! Baco did not have a favorite Domaine Berrien wine – he loved them all! Baco passed away on February 13, 2015, but will always be a part of our winery. RIP Baco Noir. 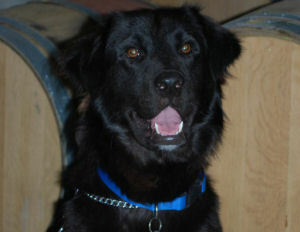 Mocha is our loveable winery barker – part Akita, part Terrier, and lots of other parts unknown! He is very sweet & loving, but he thinks it is his job to guard the back room. We think some agility training or Frisbee catching might be in his future! Mocha has taken his new role of big brother very seriously, and wrestles and plays chase with his new fur brother Maxwell. Mocha's favorite wine is Viognier or whatever is in Wally's glass! We have lovingly nicknamed him "Maxwell Smart, Agent 86." Maxwell is the newest addition to our winery family. He is part Golden Retriever, part Terrier/Boxer and 100% adorable! 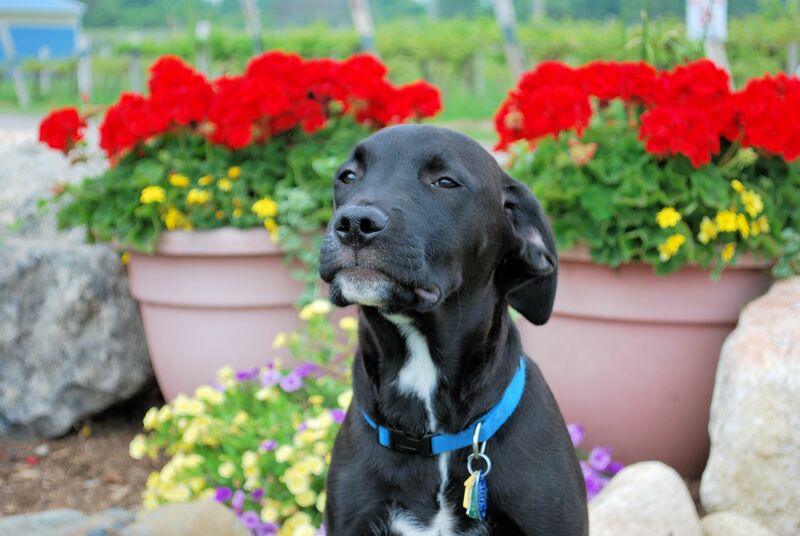 He was adopted at 10 weeks old and is keeping all of us on our toes while he learns his winery manners. Maxwell has mastered swimming and stick chewing and his new skill is drinking Grandma's Red when it drips out of the dirty wine glasses in the dishwasher! Mocha is our most recent addition to the Domaine Berrien family – part Akita, part Terrier, and lots of other parts unknown! He is very sweet & loving and is currently learning his winery manners from his big “brother” Baco. We think some agility training or Frisbee catching might be in his future! Mocha is still too young to drink, so we don’t know which wines are his favorites yet!